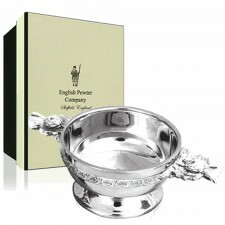 English Pewter Company Celtic Pewter Quaich 3.5"
This Celtic style Quaich features two beautiful Celtic style handles along with an intricate and stylish Celtic style design on the inside of the bowl itself. This pewter Quaich features two beautiful Celtic style handles along with an intricate Celtic style design on the inside of the bowl. 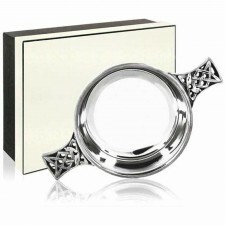 This quaich has a 3.5'' diameter highly polished bowl with an intricate and stylish Celtic style design on the inside of the bowl. 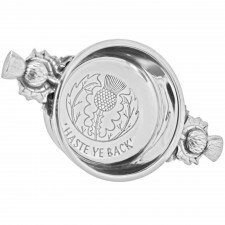 Celtic Knot Handles Pewter Quaich 3"
Haste Ye Back Pewter Quaich 2.5"
Scottish Thistle Handles Pewter Quaich 2.5"
Scottish Thistle Handles Pewter Quaich 3"